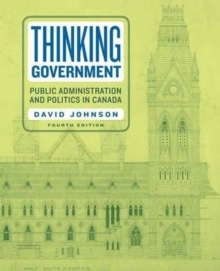 Thinking Government: Public Administration and Politics in Canada, Fourth Edition introduces students to power relations between elected politicians and unelected public servants, while also covering important topics such as the institutions of the federal government, financial and human resources management, and accountability and responsibility. Johnson explores the ways that the ideological framework of this country shapes what Canadians, their political parties, and their governments think about policy actions and the responsibilities of public servants. The fourth edition is revised and updated throughout, and addresses the legacy of the Harper government on public administration in Canada. Comprehensive pedagogical supports for students highlight key issues in public administration to help connect theories to the reality of practice.